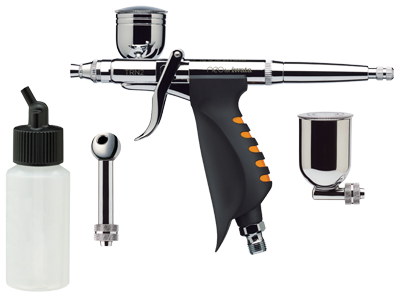 The Neo TRN2 Side-Feed Dual-Action Trigger Airbrush comes with interchangeable 0.20oz / 6ml cup with lid, 0.50oz / 15ml cup and a 1oz / 30ml bottle. Additional cups and Big Mouth Bottles are available, sold separately. The innovative dual-action pistol trigger design offers simple, ergonomic operation and the pre-set handle allows even the beginner to pre-set the spray performance for any line, any background, any shade, perfectly every time. Fine atomisation is achieved with the smallest air compressors, making Neo for Iwata an affordable option for general purpose spraying and for anyone wanting to airbrush for the first time.